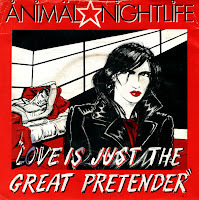 Animal Nightlife had a hit with 'Love is just the great pretender' in July 1985, reaching number 28 in the UK singles chart. That single was featured on this blog two years ago (here). I found this single the other day, which features a rather different version of the song. It was released in 1982 on the Inner Vision label. Proof that the band existed a few years before they actually became better known. Animal Nightlife originally released 'Love is just the great pretender' in 1984. When this single did not chart and the follow-up 'Mr. 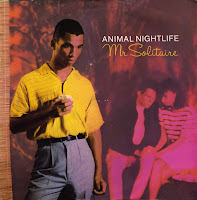 Solitaire' did, the band decided to have the track remixed and released it as 'Love is just the great pretender '85'. This did the trick: the single climbed up the chart and peaked at number 28. The B-side of this single is an instrumental track that fits into Sade's catalogue seamlessly. Or did I already make that comparison before? 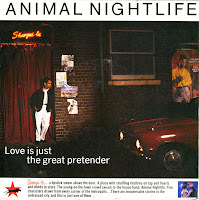 It would be fair to say that the band Animal Nightlife made music very much like the band Sade: funky, jazzy, soulful music with good melodies and catchy choruses. The band formed in the early Eighties, its members were vocalist 'Flid', Leonardo Chignoli, Billy Chapman, Paul Waller and Andy Polaris. The music video for 'Mr. Solitaire' was a regular on music channels in 1984. It caused me to get a bit sick of it in the end. That summer, it peaked at number 25 in the UK singles chart. Years later, I realised I wanted to have this song - and then spent ages trying to find it.